For your convenience, you can now order Sunzyme online. What Makes Sunzyme Better and Unique? Sunzyme stain and odor control is a natural blend of 5 different enzyme-producing bacterial strains that are safe and effective for the elimination of organic stains and odors. 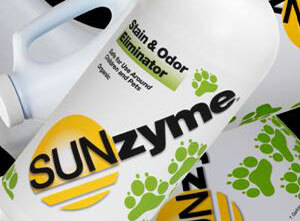 Sunzyme removes stains and odors from carpet , wood, concrete, clothing, bedding and more. Sunzyme is safe to use around people and pets (non-toxic, biodegradable, non-flammable). At over 200 billion enzyme-producing Colony Forming Units (CFU) per gallon it is highly concentrated and can be diluted 1:1 or 2:1 with warm water. This makes Sunzyme economical. Sunzyme breaks down organic matter such as fats, grease, urine, cellulose, carbohydrates, starches and uric salts. Sunzyme is the choice of professional carpet cleaners nationwide and is also used by pet owners, nursing homes, assisted living, home health care, hotels, apartments, vacation rental, automotive and boat detailers and more. “I came across Sunzyme at a professional dog training seminar. I purchased some on a whim, and I was so impressed with its ability to neutralize odors that I decided to become a distributor.